TXAB: The Christ Almighty Blog: The King James Version: Its history and worshipers. The early days of bible translation. King James Version adherents have their own strange little history of the translation. Basically, God had the prophets and apostles write the original Hebrew and Greek books; then the evil Roman Catholics got hold of it, corrupted it, and translated the corruption into Latin so nobody but they could read it. (Yet for some reason still wouldn’t let anybody read it, or translate it into local languages.) But heroic English Protestants somehow got hold of the originals, good King James ordered them translated into English, the Holy Spirit inspired the translators to do the best job ever, and here we are with an infallible translation. All English translations since? Based on the corrupt versions. Don’t buy or trust any of ’em; get yourself a good ol’ King James. That’s the myth. Here are the facts. In 382, centuries before the Roman Catholic Church came to exist, Bishop Damasus of Rome (who later became called Pope Damasus 1 by the Catholics, but at the time these “popes” only ran the churches in town; not the entire worldwide network which exists today) tasked his assistant Eusebius Sophronius Hieronymus to produce a much better Latin translation of the gospels. Up to this point there were various Latin translations of the bible floating around, and all were iffy. Damasus wanted a good translation. Hieronymus, whom we nowadays call St. Jerome, got to work. Over time Jerome came to conclude the “original Greek” of the Old Testament—meaning the Septuagint, a Greek translation of the Hebrew scriptures—wasn’t gonna cut it. He moved to Israel to get better at Hebrew, and translated the Old Testament from the original. Thing is, a lot of Christians in his day believed the Septuagint was an infallible translation—why learn Hebrew? Why study with Jews?—they’d only corrupt him into thinking like a Pharisee, not a Christian. It’s for this reason a lot of Orthodox Christians still use the Septuagint. Jerome didn’t translate the whole bible; just a lot of it. Enough so he tends to get credit for the whole. The Vulgate—the Latin bible—became the western church’s go-to translation, just as the Septuagint remained the eastern church’s translation. And when the church formally split into Orthodoxy and Catholicism some 700 years later, the Catholics, in order to show how Greek they weren’t, made the Vulgate official. For the longest time, Catholic bible translations were only based on the Vulgate. Not the original Greek and Hebrew. Yes, there were Catholic bible translations. Lots of them. Still are. When the locals don’t speak Latin, but their priests figured the locals oughta learn what’s in the scriptures, they make translations. But all of them have to sync up with the official bible, the Vulgate (now the New Vulgate); and all of them have to be approved by the bishops. That’s why translators fell afoul of the Catholics: They went rogue. John Wycliffe, who translated the Vulgate into Middle English by 1384, had his own ideas about the Catholics, didn’t trust bishops, and never sought their approval. So he was persecuted as a heretic, and his bible forbidden. Hey, would you trust a bible produced by someone who thinks your church is run by the Antichrist? William Tyndale is another case. He became Protestant before King Henry 8 of England did. He hid out in Germany, translated most of the bible, and published his New Testament in 1526. But the English caught up with him, and he was killed as a heretic in 1536. Yet only three years later the Great Bible, the first official translation of the Church of England, was published—and it was largely based on Tyndale’s translation. Yes there were English-language bibles before the KJV. In fact, one of ’em was the very reason the KJV was produced. Competing with the Geneva Bible. Your average KJV fan has never heard of the Geneva Bible, and if you mention it they’ll just assume it’s Swiss. It’s actually Scottish—and yes, it’s written in English; that’s what Scots speak. It was translated in Geneva by folks who studied under John Calvin, Geneva’s non-Catholic bishop. Hence its name. Published in 1576, the Geneva Bible was deliberately published for the masses, not the churches. The goal was for everyone to own one. It was printed in a portable size, and cost less than a week’s wages. It had chapters and verses, unlike other bibles, so you could find everything. It had illustrations and maps. It had study notes—a running commentary, written by Laurence Tomson, which explained every hard-to-understand passage. Brilliant idea, right? And it turned Britain into a biblically literate island. It became England’s most common translation. William Shakespeare quoted it, as did John Donne and John Bunyan. Oliver Cromwell’s troops carried copies. The “Pilgrim Fathers” brought it to Plymouth on the Mayflower, and the Puritans used it for decades thereafter. All to the great annoyance of King James 6 of Scotland, who after the death of Queen Elizabeth 1 became King of England as well. And wanted it gone. Once James became king of England, he authorized a new translation—one intended to become as widespread as the Geneva Bible had become. It was to be based on the Bishops’ Bible, a 1602 update of the Great Bible; it was to conform to the teachings of the Church of England, not the Church of Scotland; the word tyrant was banned; and it was to have no study notes or commentary. If people weren’t sure about a passage, they were expected to ask their priest. The version he authorized (which is why it’s also called the Authorized Version) was published in 1611, and commonly named after King James. So how’d it overtake the Geneva Bible in popularity? Simple: Archbishop of Canterbury William Laud banned the Geneva Bible in 1637. No more competition. But by that point the Geneva Bible had done its work. The English Civil War, where Parliament overthrew and beheaded James’s son King Charles 1 for crimes against the state in 1649, was only possible because the English-speaking people had learned the king was not above the law. One step closer to democracy. You’re likely not familiar with the KJV’s original 1611 edition. Its spelling was corrected and standardized in 1769 by Benjamin Blayney. Its apocryphal books—the books Protestants don’t consider part of the bible—were removed in most American editions. Otherwise it’s essentially same as the original, and is still one of the official translations of the Church of England. After four centuries of English-speakers reading it, it’s had a profound influence on our language. To a large degree, it standardized it: We defined words based on the way the KJV seemed to use them, and a lot of Americans still spell “Savior” with a U because the KJV does. And since it was deliberately translated to be read aloud—which is part of the reason it’s so memorable—a lot of the KJV’s phrases have become common English idioms and sayings. 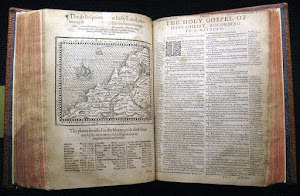 As I pointed out, the KJV was based on the Bishops’ Bible. Which was based on the Great Bible, which was based on William Tyndale’s bible. About 80 percent of the KJV is unchanged from Tyndale’s version. The translators only tweaked it where necessary. How’d they tweak it? They compared the Old Testament with the Septuagint, the Vulgate, and Daniel Blomberg’s 1525 Hebrew Rabbinic Bible. The New Testament was compared with Robert Estienne’s 1550 Textus Receptus and Theodore Beza’s 1582 Greek New Testament. And the translators picked and chose which version they liked, rather than consistently sticking to one original text. When they chose to change a verse from the way the Bishop’s Bible had it, they sometimes didn’t bother to retranslate it themselves: They just went with Tyndale, or the Geneva Bible, or the Douay-Rheims bible (an English-language Catholic bible—yes, Catholics had English bibles!—which had published the NT in 1582, Genesis through Job in 1609, and Psalms through 2 Maccabees in 1610), or even a recent translation of John Chrysostom’s letters which happened to include bible quotes. Look, there’s nothing wrong with doing this when the other translation is an accurate one. But it doesn’t really look like they were going for accuracy. More like they were rushing the job. And mainly they were just making sure the KJV conformed to the Church of England’s theology. Rather than, appropriately, the other way round. Fortunately the translators were by and large orthodox Christians, so we don’t have to worry about heresy in the KJV. Just translation errors. Then there’s this minor issue: The KJV’s language is now 500 years out of date. (Yes, I know it was only published 405 years ago, but like I said, it’s 80 percent Tyndale.) The average English speaker finds it just as hard to slog through as reading Shakespeare. A good education in literature, plus a good vocabulary, will make up for that. There’s no reason, with effort, you can’t read the KJV. But when you’re first presenting the bible to newbies, you shouldn’t have to first teach them KJV-English before you can teach ’em bible. You need a bible which is in our English, like the NKJV, or other translations. After the KJV was first published, it was a long time before anyone bothered to translate the bible into English again. After all, why? The KJV’s a good translation. If you’re the paranoid type, or the anti-intellectual type, you’re not gonna trust those scholars who updated the Hebrew or Greek texts. Or even think they need updating. They’re “the originals,” aren’t they? Why’re people monkeying with the “originals”? What’s their angle? Are they trying to corrupt the bible or something? And multiple bible translations: What’re you saying? That the KJV can’t be trusted anymore? That we need to throw it out? We’ve based our faith, our lives, on that bible, and now we gotta buy Revised Versions? What the what? The original documents used for the KJV were best. Supernaturally preserved by the Holy Spirit for all those centuries, Ps 12.6-7 but now the textual critics are picking ’em to death and taking out words and verses. And comparing them with third-century copies of the New Testament from Catholic museums. Catholics! What’re you doing trusting Catholics? You heretics. Multiple translations of the bible erode confidence in the bible, and people will ditch Christianity over it. Or it’ll confuse people: When Pastor quotes the KJV, but your NIV or ESV says something different, or doesn’t mean at all what Pastor says it does… well, you have no business exposing Pastor’s lack of careful study confusing people like that. New translations don’t concentrate on how the bible sounds, when spoken aloud, like the KJV. Using commonplace words instead of formal words makes the bible sound less majestic, less honorable, less respectable. And using “you” instead of “thee” will confuse people as to whether “you” means one person or lots of people. (Which, I admit, is a good point.) Leave the bible as-is. Leave it grand. The translators of the KJV were inspired by God to produce a flawless bible. The KJV has no errors. It’s precisely as the Holy Spirit wanted it translated. Heck, you can even correct the Greek versions with it if you needed to. Not every KJV-Only adherent holds to that last one, but quite a lot of them do. But that’s the line they cross between great respect for a good translation of the bible… and idolatry. More precisely bibliolatry, bible-worship. And you’ll notice how the idolatry makes ’em weird. Rather than a civil, respectful disagreement about which bible translation is best, most of them are angry, hostile, vicious, rude, and slanderous, against any Christians who dare to use other translations. They’ll spread lies about ’em, call ’em antichrists and sell-outs, and say just about anything they can think of. Rather than quote the bible carefully and in context for their defense, they quote it like madmen, who think it means whatever they wish so long that they believe hard enough, and can shout loud enough. Which is to be expected of an idolater. The lack of love, peace, patience, and kindness is a sign their close personal relationship isn’t with Christ Jesus. It’s with the King James Version. Again, the KJV is a good translation. Even a great one. Not the best; there is no such thing. Certainly the one with the greatest cultural impact on English-speaking culture. Definitely one you can read and profit by, and get to know Jesus through. But forsaking all other translations, and claiming they’re of the devil? That’s where you’ve lost touch with reality. And with the Holy Spirit, who uses those other translations all the time to bring people to Jesus.